Togo, West Africa has one of the highest deforestation rates both globally and on the African continent, with recent reports showing only about 5% of forests remaining in the country. Enter the Institute for Community Partnerships and Sustainable Development (or ICPSD), a non-profit based in Moscow, ID, whose mission is to empower African communities to be self-sufficient, and at the center of their own development. In 2016, ICPSD partnered with the University of Idaho’s Center for Forest Nursery and Seedling Research (CFNSR) to create a native plant nursery and demonstration site in the town of Notsé, Togo. Because the University of Idaho has a reputation for providing the leadership, sound science, and experiential learning necessary to build successful nursery programs, not only domestically, but also across the global arena, there was a natural progression toward a collaboration between these two entities. The UI, ICPSD and Lolonu Cooperative teams celebrate the first day of nursery workshops. In July 2016, a group of U of I faculty, staff, and students joined ICPSD representatives in Notsé to carry out the first phase of the Togo Nursery Project. Specific objectives for the initial visit were centered around installing a physical nursery structure, sowing the first crop of trees, teaching technical workshops in propagation, best management practices, and long-term seedling care, building local partnerships in-country across public and private organizations, and engaging local youth in outreach activities. In addition to these objectives, a principle goal was – and continues to be – to make a connection with Notsé’s local women in terms of teaching the technical nursery workshops and for long-term nursery staffing. The team was fortunate to have the opportunity to partner with Lolonu, a local women’s cooperative group from the Notsé area. The women’s group received training in general nursery practices, and five individuals were elected to serve as the nursery staff. This small staff was trained further in specific seedling care and in-depth daily practices for the nursery crops. A Togo-specific curriculum was created for this project, and workshops included training on container choice, potting media, seed preparation and sowing, water science, irrigation practices, pest management, out-planting, and data management. The curriculum was created with the intention of providing this information in a way that marries the science and data of nursery management with the practicality of being on the ground in an area that may have limited access to supplies. Technical workshop training included both classroom and on-site sessions. The Togo Nursery currently has a focus on species that are native to the region. Native trees are not only more adapted to local growing conditions, but can aid in the diversification of forests and help to mitigate the mono-cropping that is a standard practice in the region. The nursery currently has a capacity of five thousand seedlings and crops are comprised of Cola gigante (Giant cola), Khaya senegalensis (African mahogany), Samanea saman (Raintree), Blighia sapida (Ackee), and Cassia sp. (Cassia). In addition to seed availability considerations, these species were also selected to provide a variety of uses, including timber, cultural considerations, edible fruits, nitrogen fixation, and carbon sequestration. In addition to producing seedlings for agroforestry and reforestation efforts across Togo, the nursery is intended to act as an education and training site on local, regional, and national levels. Local high school and university students have already been involved in nursery construction, production, and outplanting designs meant to test seedling competition and survival rates in restoration conditions. 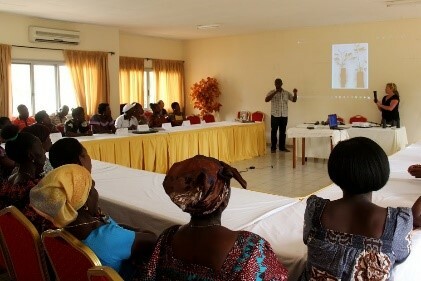 Workshops have also been held for Togolese professionals, including foresters, government representatives, and personnel from regional non-profits and NGO’s. Subsequent trips to Togo during 2016-2017 have focused on long-term seedling care, facilitating continued interest and momentum from local groups, additional outreach to student groups, and the implementation of out-planting designs. Future goals include developing additional curriculum lessons on pruning, monitoring, and asexual propagation, translating materials into French, locating consistent seed collection areas with quality seed, securing seed storage facilities, and looking to fine-tune nursery practices that will guide appropriate propagation timelines for future nursery crops. It will also be important for the project to secure an on-site water source to reduce labor time and costs. As the Togo Nursery moves forward, it is imperative that the visiting teams continue the tie-in of this particular project with the need for this kind of work on a global scale. For more information on this project contact Becca Lieberg; Anthony Davis; Andrew Nelson, Department of Forest, Rangeland and Fire Sciences, University of Idaho, Moscow; or Romuald Afatchao, Executive Director, ICPSD, Moscow. To find out how you can help, please visit ICPSD. Newer PostFalklands Conservation: Sheep Poop and Native Seeds Can Be a Successful Recipe for Restoration!